To analyze the level of fragmentation on my hard disks, I used Defraggler, a free defragmentation tool. As you can see in the screenshot below, my system drive 'C:' had a total of 429 fragmented files which represented 6 GB from the total of 22.4 GB of used space. To run the benchmark, I used Disk Defragmenter and not Defraggler, as the expected results must come from the Windows Vista tool. I had configured it to defrag only my system drive 'C:'. How I did the testing? 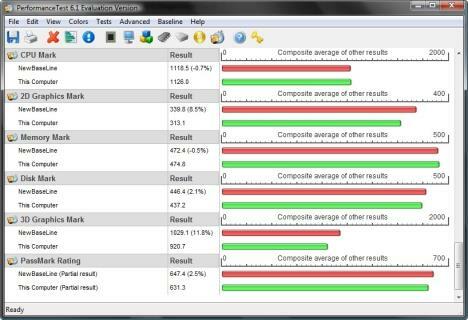 CPU Mark - is a general CPU test suite, which benchmarks things such as calculations with integer and floating point numbers, compression & encryption performance, random string sorting, etc. 2D & 3D Mark - tests the video performance when carrying out 2D and 3D graphics operations. Disk Mark - benchmarks the performance of your hard disk units and is the most relevant benchmark when showing the performance impact of the defragmentation process. Memory Mark - contains a series of tests which exercise the memory sub-system of your computer when reading or writing from or to RAM. After performing these tests, PassMark PerformanceTest shows a mark for each of them and a general PassMark Rating. This rating is a weighted average of all the other test results and gives a single overall indication of the computer's performance. The tests were ran before starting the Disk Defragmenter to record the baseline of results. Then, I launched Disk Defragmenter and started the defragmentation process for the system drive 'C:'. During the defragmentation process, I ran the same tests, saved the results and compared them with the baseline. As you can see in the screenshot below, the overall performance difference is quite small. The PassMark Rating has only decreased with 2.5%, from 647.4 to 631.3. Going into more details, I noticed that there are areas where the defragmentation process has no negative impact. For example, it doesn't seem to affect at all the CPU and Memory performance: the results of the CPU Mark and Memory Mark tests actually increased with 0.7% and 0.5% respectively during the defragmentation process. While it is hard to explain why there is an improvement in these tests, it is very good to see that there is no negative impact. I have repeated these tests a few times, and there was always a very small increase in results (up to 0.7%). As expected, the areas which are influenced by the defragmentation process are the graphics and hard disk performance. During the 2D Graphics Mark test, the results decreased by 8.5%. For the 3D Graphics Mark, the difference was even bigger, the final results showing a decrease of 11.8%. The results of the Disk Mark test showed a decrease of 2.1% in performance. Even though I expected to see a decrease, it is good to see that the impact on disk performance is not that high. The results of the benchmark were surprisingly positive. Unless you want to play games on your PC or you need to use applications which intensively use your hard disks (e.g. simultaneously downloading many files through file sharing clients), the performance impact is negligible. An impact of only 2.5% on the overall system performance during the defragmentation process is a small price to pay, considering the benefits of regularly defragmenting the data on your hard disks. Yeah, but the Vista defragger is soooooo slow, so what's the use even if it runs at a low priority. 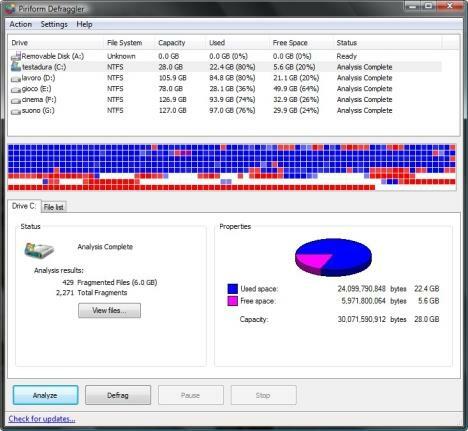 It took over 8 hours to defrag my friend's 160GB moderately fragmented laptop drive. Surely, the defragger chipping away at the drive for so long is not good because it generates way too much heat (the palmrest was very hot) and overheats the laptop. In stark contrast, there is Diskeeper 2008 that I am currently trying (free trial version FTW!) and it's blazing fast and defrags the driver automatically, while using neglible amount of resources. The only downside is that the full version is not free. But if you are interested in keeping the drives running nicely, then it's definitely a worthwile investment. The principle of scheduled auto-defrag in Vista is "forget about defrag and keep me working when you do other things", not to be blazing fast when you this as monotask manual defrag. I prefer to forget about disk maintenance (the Vista defrag approach). I did this test: NEVER defragged manually my HD since March 2007, the other (Nov 2008) day I tested the defrag status of my 80GB HD (I've been installing/uninstalling EVERYTHING including large games, I've added SP1 etc. etc.) and showed me a 9% defrag (no further actions needed)! I think this proves it's a good solution. Forget about the old manual disk maintenance you were used to on XP. My main beef with vista's defragger is not that it's automatic, but that it's slow. And slow is not good, because it needlessly works the drive for long and generates heat. I think it's slow because it's inefficient i.e. it does not properly/intelligently utilize system resources that are *otherwise* idle, which DK does very nicely. Just out of curiosity, how did you analyze the fragmentation level on the 80GB drive? I ask only because the Vista defragger fudges the numbers a little bit...normally it does not report fragments larger than 64MB. It considers them as 'non-fragments' and skips them while defragging. Just try vopt for defraggmenting. Its the best i have ever seen.